Having your own Hotpoint washer and dryer is far more convenient than hauling your clothes down to the nearest laundromat. Unfortunately, you are also responsible for fixing the machines if anything goes wrong. Before you pay for a repairman, go through some basic troubleshooting steps to see if you can correct the problem yourself. If you find any defective items, make sure you use Hotpoint replacement parts that are designed for the make and model of your dryer. Learn how to troubleshoot common Hotpoint dryer problems. Make sure the dryer is getting power from the house. Confirm that the power cord is plugged in and the breaker switch has not been tripped. Reset the breaker switch and replace any blown fuses you find at the circuit breaker box. Inspect the idler pulley, blower wheel, rear drum bearings, drum rollers, and the glides near the front of the drum if you are hearing odd noises coming from the dryer as it runs. Replace any defective parts you find. 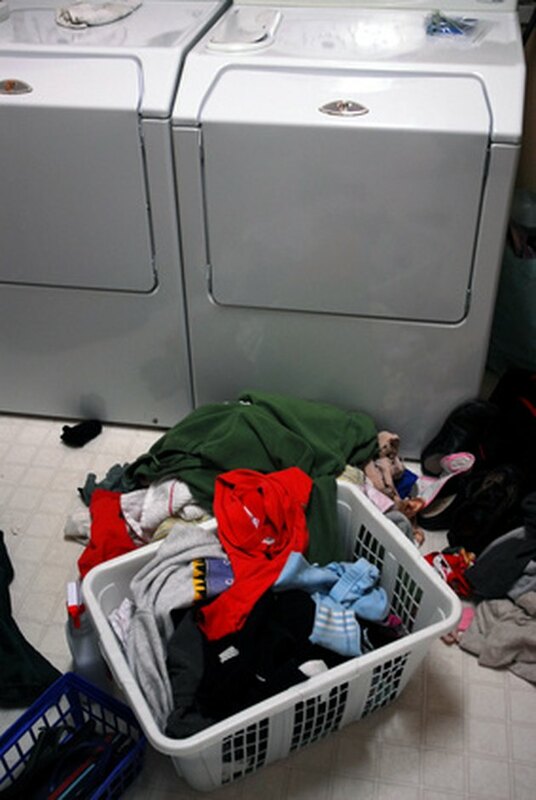 Examine the drive belt if your Hotpoint dryer is not tumbling the clothes inside the drum. Pry off the dryer's top panel with a screwdriver to access the drum. Look at the drive belt to make sure it is not loose or broken. Examine the idler pulley for signs of wear. Replace any parts that appear to have a problem and press the top panel back onto the dryer unit. Check the igniter if you have no heat and a gas Hotpoint dryer. The igniter is attached to the end of the burner tube inside the front of the dryer cabinet. It should glow orange as the dryer heats up. Use a circuit tester to test the heating element if you have an electric dryer. Clear out the dryer duct and the vent on the outside of the house if your clothes are taking too long to dry. If this does not correct the problem, the cycling thermostat may be defective and in need of replacement. For gas dryers, use a circuit tester to check the flame sensor that is located near the igniter and the electrical coils on the gas valve. If either one of these are defective, the flame will shut off before the clothes are done drying.